For the Marvel Comics planet, see Counter-Earth (comics). The Counter-Earth is a hypothetical body of the Solar system hypothesized by the pre-Socratic Greek philosopher Philolaus (c. 470 – c. 385 BC) to support his non-geocentric cosmology, in which all objects in the universe revolve around an unseen "Central Fire" (distinct from the Sun which also revolves around it). The Greek word Antichthon (Greek: Ἀντίχθων) means "Counter-Earth." In modern times a hypothetical planet always on the other side of the Sun from the Earth has been called a "Counter-Earth", and has been a recurring theme in fiction, science fiction and UFO claims. Philolaus believed there was a "Counter-Earth" (Antichthon) orbiting the "Central Fire" (not labeled) that was not visible from Earth. The upper illustration depicts Earth at night while the lower one depicts Earth in the day. An astronomical system positing that the Earth, Moon, Sun, planets and unseen "counter-earth" revolve around an unseen "Central Fire" was developed in the 5th century BC and attributed to the Pythagorean philosopher Philolaus. Philolaus' universe moved "the earth from the center of the cosmos", and provided the insight that "the apparent motion of the heavenly bodies" was (in large part) due to "the real motion of the observer"—i.e. Earth. In Philolaus' system, the Earth did not rotate and its inhabited surface faced away from the Central Fire—possibly because it (the Earth) was flat. The revolution of the Earth around the Central Fire was not yearly but daily, while the Moon's revolution was monthly, and the sun's yearly. It was the Earth's speedy travel past the slower moving Sun that resulted in the appearance on Earth of the Sun rising and setting. Further from the Central Fire, the Planets' movement was slower still, and the outermost "sky" (i.e. stars) probably fixed. Along with the Central Fire, the "mysterious" Counter-Earth (Antichthon) was the other heavenly body not visible from Earth. We know that Aristotle described it as "another Earth", from which Greek scholar George Burch infers that it must be similar in size, shape and constitution to Earth. Some (astronomer John Louis Emil Dreyer) think Philolaus had it following an orbit so that it was always located between Earth and the Central Fire, and a tale of Greek mythology may have placed it in that location to stop man from looking at the throne of Zeus directly. However, Burch argues Philolaus must have thought it orbited on the other side of the Fire from Earth. Since "counter" means "opposite", and opposite could only be in respect to the Central Fire, it follows that the Counter-Earth must be orbiting 180 degrees from Earth. "If there was a single Earth revolving at some distance from the center of space, then the universe's center of gravity, located in the Earth as its only dense body, would not coincide with its spatial center ... The universe, consequently, would be off center, so to speak—lopsided and asymmetric—a notion repugnant to any Greek, and doubly so to a Pythagorean." This could be corrected by another body with the same mass as Earth, orbiting the same central point but 180 degrees from Earth—the Counter-Earth. In the 1st century A.D., after the idea of a spherical Earth gained more general acceptance, Pomponius Mela, a Latin cosmographer, developed an updated version of the idea, wherein a spherical Earth must have a more or less balanced distribution of land and water. Mela drew the first map on which the mysterious continent of Earth appears in the unknown half of Earth—our antipodes. This continent he inscribed with the name Antichthones. Philolaus's ideas were all eventually superseded by the modern belief that a spherical Earth rotating on its own axis was one of several spherical planets following the laws of gravity and revolving around a much larger Sun. The idea of a Counter-Earth waned after the heliocentric model of the solar system became widely accepted from the 16th century. In the contemporary world "Counter-Earth" usually refers to a hypothetical planet with an orbit as Burch described, on the other side of the "Central fire"—i.e. the Sun. It cannot be seen from Earth, not because Earth faces away from the center,[Note 1] but because the Sun's great size blocks its view. It has been a recurring motif in science fiction, fiction—often serving as an allegory for the real Earth—and UFO claims. A planet orbiting the Sun so that it was always on the other side of the sun from Earth could have such an orbit because it was the same distance from the Sun and had the same mass as Earth (according to the theory). [Note 2] Thus, what would make it undetectable to astronomers (or any other human beings) on Earth would also make it habitable to beings at least similar to humans. With the same size and distance from the Sun as Earth, it could have the same (or very similar) surface environment—gravity, atmospheric pressure, and surface temperature range. At the same time such a planet could have the same orbiting velocity and path as Earth, so that if it was positioned 180 degrees from Earth, it would remain behind the Sun being blocked from view from Earth indefinitely. The 1968 Scientific Study of Unidentified Flying Objects headed by Edward Condon at the University of Colorado even included a "Numerical Experiment on the Possible Existence of an 'Anti-Earth'" as an appendix. A contour plot of the effective potential due to gravity and the centrifugal force of a two-body system in a rotating frame of reference. (In the context of this article the two bodies are the Sun—yellow; Earth—the dark body between L1 and L2. The Counter-Earth is L3.) The arrows indicate the gradients of the potential around the five Lagrange points—downhill toward them (red) or away from them (blue). Counterintuitively, the L4 and L5 points are the high points of the potential. At the points themselves these forces are balanced. However, if such a planet actually existed, the laws of physics and cosmology would make it detectable from Earth for a number of reasons. A Counter-Earth would have gravitational influence (perturbation) upon the other planets, comets and man-made probes of the Solar System. Researchers have detected no such influence, and indeed space probes sent to Venus, Mars and other places could not have successfully flown by or landed on their targets if a Counter-Earth existed, as the navigational calculations for their journeys did not take any putative Counter-Earth into account. Roughly speaking, anything larger than 100 miles (160 km) in diameter should have been detected. The gravitational forces of the other planets on a Counter-Earth would make its orbit unstable. Venus has 82% of the mass of Earth and would come within 0.3 AU of the location of a Counter-Earth every 20 months, providing considerable gravitational pull that over the years would move its orbit into sight of observers on Earth. 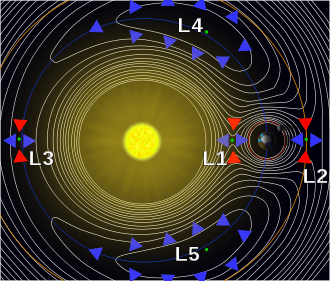 If a Counter-Earth was much smaller than Earth, its location at the "Sun–Earth L3" Lagrangian point (see diagram), would mean the combined gravitational pull of the two large masses of Earth and Sun would provide "precisely the centripetal force required to orbit with them". But a small planet would be even more influenced by the orbit of Venus, Mars and Jupiter, making it even more unstable. Two bodies orbiting a barycenter located inside the larger body. Any planetary sized body 180 degrees from Earth should also have been visible to some space probes, such as NASA's STEREO coronagraph probes (two spacecraft launched into orbits around the Sun in 2006, one farther ahead of and one behind the Earth's orbit) which would have seen the Counter-Earth during the first half of 2007. The separation of the STEREO spacecraft from Earth would give them a view of the L3 point during the early phase of the mission. If a Counter-Earth had an electromagnetic energy signature similar to that of Earth's, it would be able to be detected by astronomers since the signature would extend well beyond the surface of an Earth-like planet. The Sun's "wobbling" motion around its "barycenter" would prevent it from blocking all signs of that energy from Earth, at least for part of the year. The Sun does not remain stationary—relative to its planets—at the center of the solar system because of the gravitational pull of the most massive planet—Jupiter. [Note 3] The Sun wobbles around the "true" center known as a barycenter, which lies just inside the Sun. When the Sun's position is 90 degree from the barycenter relative to Earth, it would come close to "unblocking" from view a planet 180 degrees from Earth, enough to reveal the aforementioned hypothetical signature. For a Counter-Earth orbiting the same path as Earth to always stay 180 degrees from Earth, the two planets would have to have circular orbits, but Earth's orbit is elliptical. According to Kepler's second law, a planet revolves faster when it is close to the star, so a Counter-Earth following the Earth on the same orbit with half a year of delay would sometimes not be exactly 180 degrees from Earth. To remain hidden from Earth, the Counter-Earth would require an orbit symmetrical to Earth's, not sharing the second focus or orbit path. Twin Earths is an American science fiction comic strip written by Oskar Lebeck and drawn by Alden McWilliams that ran in Sunday and daily newspapers from 1952 until 1963. The strip was distributed by United Feature Syndicate. The daily strip began on June 16, 1952, the Sunday on March 1, 1953. The Sunday was drawn in a half page format, but it was available in smaller formats with dropped panels. Gor is the name of the Counter-Earth that is the setting for a series of 32 novels by John Norman. The 1969 science-fiction film Doppelgänger (also known as Journey to the Far Side of the Sun), depicts the discovery and investigation of another planet sharing Earth's orbit on the opposite side of the Sun. Two 2011 films—Another Earth and the Lars von Trier's film Melancholia—feature a plot in which a planet emerges from behind the Sun and approaches Earth. Several Marvel Comics or spinoffs of comics were set, or had parts of a story set, in a Counter-Earth. These included The High Evolutionary, The Spider-Man Unlimited TV series and the associated comic book, Infinity Crusade: Paradise Omega, The Earth of The New Universe, and the Heroes Reborn Earth ("more of a Pocket Dimension than an actual planet"). For a more in-depth explanation of the Counter-Earth used by Marvel Comics, see Counter-Earth (comics). On The Adventures Of Superman radio series, the planet Krypton is said to be "situated on the other side of the Sun" from the Earth in the first episode. In the 1969 Kaiju film Gamera vs. Guiron, A Counter-Earth named Terra exists on the opposite side of the solar system to Earth, but presumably within the same habitable zone. A UFO takes two kids to the planet, where they are threatened by a pair of the final members of the Terran race who were decimated by extraterrestrial Gyaos birds, and their 'guard dog' Guiron. Gamera comes to Terra to save the children, and after a long fight, is eventually victorious. In Doctor Who, the planet called Mondas was once a Counter-Earth that left Earth's orbit when the moon arrived from outer space and the gravitational fields were unbalanced. The planet floated to the extremes of the Solar System and froze so that its inhabitants were forced to turn themselves into a half-human half-machine species, the Cybermen, as revealed in Season 4 episode The Tenth Planet. Previously in 1963 the Doctor Who production team commissioned scriptwriter Malcolm Hulke to write The Hidden Planet, a story set on a Counter-Earth. The script was eventually abandoned, but eight subsequent Doctor Who scripts written or co-written by Hulke were televised between 1967 and 1974. ↑ Pythagoreans are thought to have believed that humans inhabited the side of earth facing away from the Central Fire and Counter Earth. ↑ The closer to the Sun and/or smaller a planet is, the faster it orbits the Sun; the larger and farther away it is, the slower. How are mass and orbital period related? (More massive planets orbit (slightly) slower than smaller ones.) "Kepler's Third Law implies that the period for a planet to orbit the Sun increases rapidly with the radius of its orbit". ↑ Other planets have an effect on the Sun's motion but theirs are not nearly as strong as that of Jupiter. 1 2 Comins, Neil F. (2010). What If the Earth Had Two Moons? : And Nine Other Thought-Provoking ... macmillan. pp. 171–172. 1 2 Source: Dante and the Early Astronomers by M. A. Orr, 1913. 1 2 3 Philolaus, Stanford Encyclopedia of Philosophy, Carl Huffman. ↑ Dreyer, John Louis Emil. History of the planetary systems from Thales to Kepler. p. 42. To complete the number ten, Philolaus created the antichthon, or counter-earth. This tenth planet is always invisible to us, because it is between us and the central fire and always keeps pace with the Earth. ↑ Heath, Thomas (1981). A History of Greek Mathematics, Volume 1. Dover. p. 165. ↑ Arist., Metaph. 986a8–12. quoted in Philolaus, Stanford Encyclopedia of Philosophy, Carl Huffman. ↑ "Greek cosmology, The Pythagoreans". University of California, Riverside. The importance of pure numbers is central to the Pythagorean view of the world. A point was associated with 1, a line with 2 a surface with 3 and a solid with 4. Their sum, 10, was sacred and omnipotent. ↑ Pomponius Mela. de Chorographia. 1 2 DUNCOMBE, R. L. "Appendix E. Report on Numerical Experiment on the Possible Existence of an "Anti-Earth"". 1968. U.S. NAVAL OBSERVATORY. Retrieved 24 October 2013. At the end of 112 years the perturbations induced by Clarion [a name for the Counter-Earth] in the motions of Venus, Earth, and Mars reached 1200", 3800", and 1660" respectively. ↑ DUNCOMBE, R. L. "Appendix E. Report on Numerical Experiment on the Possible Existence of an "Anti-Earth"". 1968. U.S. NAVAL OBSERVATORY. Retrieved 24 October 2013. The separation of [a Counter-Earth] from the line joining the Earth and the Sun shows a variation with increasing amplitude in time, the effect being most pronounced for the largest assumed mass. During the 112 years covered by the integration the separation becomes large enough in all cases that Clarion should have been directly observed, particularly at times of morning or evening twilight and during total solar eclipses. 1 2 Ron Goulart, The Funnies : 100 years of American comic strips. Holbrook, Mass. : Adams Pub.,1995. ISBN 1558505393 (pp. 194-5). ↑ Rich, Katey (July 19, 2011). "'Another Earth' presents worlds of possibilities". Cinemablend.com. a drama about what happens when a "mirror" Earth is discovered lurking behind the sun, looking exactly like our planet and containing people who are, in some strange cosmic way, twins of every single person on the planet. ↑ Andrea Magrath (2011-05-18). "Sunny Kirsten Dunst is picture perfect at the Cannes photocall for her provocative new film Melancholia". Daily Mail. London. Retrieved 2011-05-27.